Getting Crafty with Jamie: Today ONLY - Save $14.99 NOW!! Today ONLY - Save $14.99 NOW!! Stampin Up! 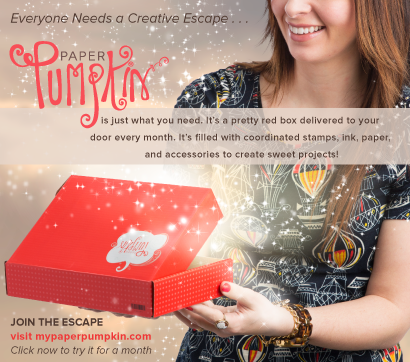 will offer YOU and any new email submitted, their FIRST Month of Paper Pumpkin for only $5 to try it out!! YES - this amazing deal of a stamp set, pre-cut card stock, embellishments and adhesive, inks ++ is ONLY $5 to try!! Do YOU want a crafting escape? These kits are GREAT! From Young-At-Heart to Young kids - the included video tutorial, the FULL Kit doesn't need help but can be a BLAST to do together! ON SALE for Only $5 today! Don't Miss Out! Have you ever thought, “One day I’ll sign up for Paper Pumpkin.” Well, THAT DAY is today. For 31 hours, first-time subscribers can get their first kit for only $5 USD/$7 CAD! The “One Day Deal” starts at 5:00 PM (MT) today. Deals like this don’t last long. Call your family. Text your friends. Shout it from the rooftops and on social media. Tell them to use promo code ONEDAYDEAL at PaperPumpkin.com before Friday, June 10 at 11:50 PM (MT). Click here to learn more on the demonstrator website and share the video below. We’ll also show a teeny tiny sneak peek of the June kit on our Facebook page later tonight, so head over there to check it out! Stamper's 10 Club Class & BOGO Sale This Saturday - you in?? This may be the best NEW Idea Book and Catalog from Stampin' Up! in ages. Come, See, Create, Connect and SAVE!! 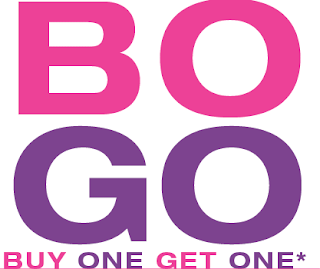 My BOGO (Buy One Get One) Sale will occur THIS Saturday ~ June 11th. ~ Join the Gettin' Crafty Stampin' Family - Grabbing the Starter Kit and receive two tickets in the drawing PLUS $99 in Non-Doubled Shopping as myyy bonus off of the BOGO Tables + Any Two Stamp sets FREE From Stampin' Up! - that's $125 + Any Two Stamp Sets and FREE Shipping for only $99! !